Jon and I are officially on a budget. We had to invest in our business a lot in 2018, so now we are on a budget to reach our financial stability goals in 2019! It’s not a sad thing or a bad thing, I’m actually really excited about it. It’s nice to have financial goals! To help with the budget, we made a pact to not eat out at all and to eat all of our meals made at home. At least for a while. Another reason we will be making this often in 2019 is the eco-friendly nature of the meal! It’s easy to make without having to buy any ingredients in plastic… and reducing our plastic consumption to the bare minimum is a big resolution of ours for 2019. I suggesting looking for beans at your local farmers market, but the bulk section at Whole Foods is a great place to buy beans that aren’t in a plastic bag. Drain the soaked beans; set aside. In a large pot over medium heat, add some olive oil and toss in the onion, bell pepper and celery. Cook until slightly browned and soft, about 8-10 minutes. Add in the minced garlic and cook for about 2 more minutes. Add in the thyme, smoked paprika, salt and pepper. Evenly combine the vegetables in the pot with the spices and cook for about one more minute. Add in the overnight-soaked beans, vegetable broth, and bay leaves, then bring to a rapid boil. Cover the pot and reduce your heat. Simmer for approximately 1.5- 2.5 hours. While the beans cook you can prepare the sautéed southern greens. For the Southern Greens and kimchi: Heat a small bit of oil in a wok or large skillet over medium heat and add in the chopped red onion; cook until slightly browned. Then add in the kale, mustard greens and collard greens; cook until lightly wilted. Remove from heat and mix in 1/4 cup Cultured Guru Kimchi. After the beans have simmered for 1.5- 2.5 hours, remove the lid of the pot and taste test a couple of beans to see if they are tender enough for you. 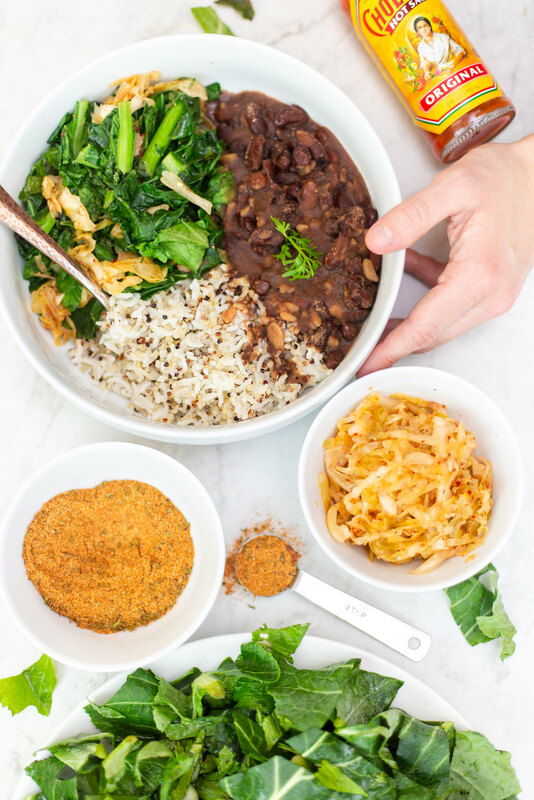 When you determine that your beans are ready, ￼serve beans with a scoop of rice and a sprinkle of hot sauce or Cultured Guru Fermented Kimchi brine ... OR BOTH! Serve along side the Sautéed Southern Greens. Note on soaking beans: I soak my beans overnight in water, but I like to add 2 tablespoons of raw apple cider vinegar and 2 tablespoons of our Cultured Guru Sauerkraut brine. I don’t know all the chemistry behind it, but adding these ingredients into the soaking process has made beans way easier to digest for me.